Looking for the best weed killers for lawns in 2019? Then you're in the right place! The Chickweed Clover Oxalis Killer is everything you need in a weed killer for your lawn turf: it's fast-acting, it kills the toughest and most aggressive types of weeds, and it's ready for use from the moment it arrives. Most importantly, it won't damage your lawn turf below and around the weeds. Here's how it works: the solution uses a combination of active ingredients which are designed to kill only the weeds, not the turf where they grow. This means that your lawn, field, or turf is safe while the weeds you're looking to eradicate are taken out. After the first application, the spray sets to work. It becomes resistant to rainfall within a few hours, and the first results become visible on weak weeds overnight. Persistent weeds may need a few days and a few more applications for full elimination. While there is no concentration or mixing involved, the spray does require the use of a separate sprayer. We endorse something like this: the Chapin 2-gallon multi-purpose garden sprayer. If you're interested in learning more about weed killers for your lawn, or want to read more about the other products we considered, see below! What Types of Weed Killers Are There? What Weeds Are Probably Growing On Your Lawn? For Best Results, Try This! Whether you like it or not, everybody is going to get some weeds popping up in the lawn from time to time. While there's no way to stop weeds from growing, there are some chemicals (and non-chemicals) you can use to control them. Most of us will turn to chemicals like pre-emergent and post-emergent herbicides when it comes down to managing the weed problems that sprout up on our lawns. A pre-emergent herbicide is a type of weed killer than basically prevents the root system from growing properly, hindering the weed from emerging from the soil. A post-emergent herbicide is a type of weed killer that works to kill weeds that have already popped up. These are usually weed killer sprays that need to be constantly reapplied. For information on when to apply these herbicides in your backyard or garden, check out the information in the video below. For those who want to take a more natural approach to killing weeds on the lawn, vinegar has shown to do just that. Because of its pure chemical breakdown of acetic acid, vinegar is lauded as a green, chemical-free way to get rid of unsightly weeds. However, a study conducted by the USDA's Agricultral Research Service shows that weeds doused with household vinegar (which has a 5% concentration of acetic acid) were only temporarily knocked back, and that it takes around four times that amount to terminate the weed. This concentration of acetic acid can be toxic when not handled properly. However, because users think that they are using a "green," household item, they don't protect themselves or the soil where they are dousing the vinegar. The end result is that more often than not, those who choose to use vinegar end up using far too much in order to compete with the effects of herbicide, effectively damaging the soil. For those who want to get in on the action, there are devices available that can help you with your weed problems. A variety of weed whackers are out there on the market, with one available for each and every skill set. These are handheld devices which use a motor and a small plastic cord to rip away at your weeds, trimming them down to be even with your grass. Are you confused about the different weeds that are popping up in your turf? Need to identify what's taking up residence on your lawn? Here's a quick crash course on what you may find lurking outdoors. This will make finding a weed killer a breeze! Lawn weeds can be split into two identifiers: monocots and dicots. These refer to how the leaves split from one another, if at all. For more of the differences between these two plants (with examples), check out the video below. These terms refer to the total lifespan of the weed species as it grows in the lawn. Annuals are weeds which mature fully from seedling to death in the span of one season. Perennials last for over two years, but can create new seeds each year. Biennials have a lifespan of up to two years and subsist off of stored food reserves. Hydration is the key to life, but did you also know that it's the key to killing weeds, too? If your weeds are stressed from drought, they'll be resistant to your attempts to use an herbicide. This is because during periods when water is scarce, weeds coat themselves with a waxy veneer that's used to seal in excess moisture. Whether you're in the throes of drought or not, be sure to water your weeds before spraying them with a weed killer. It may seem counterintuitive at first, but you're actually breaking down that waxy layer and getting to the weed itself. 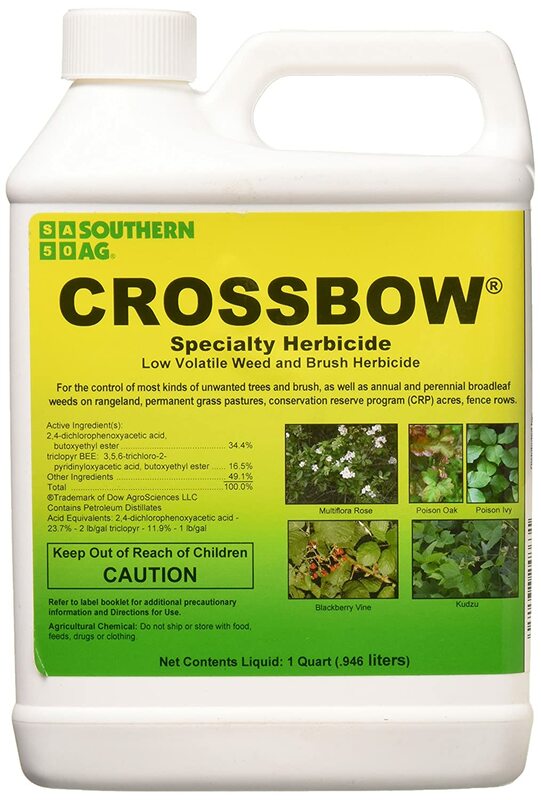 Chickweed Clover Oxalis Killer contains the active ingredient Horsepower, which is a combination of the selective herbicides Triclopyr, MCPA, and Dicamba. Basically, this is a combination of weed killers which are designed to find and kill only weeds. This is called a selective herbicide, and it's an invaluable tool for those who like to keep their gardens and lawns looking pristine. Chickweed Clover Oxalis Killer ships to customers fully ready to spray; all you'll need is a separate spray nozzle to administer the solution on your lawn or turf. After the first application, the spray begins the work immediately—becoming rainproof in just a few hours and killing weeds in the turf overnight. 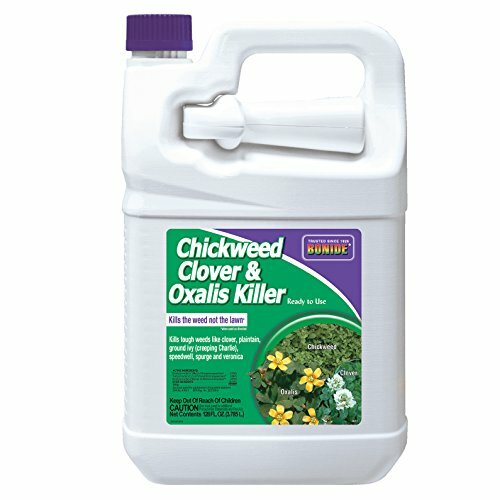 Chickweed Clover Oxalis Killer targets over 150 different types of weeds while still keeping your lawn fresh below. 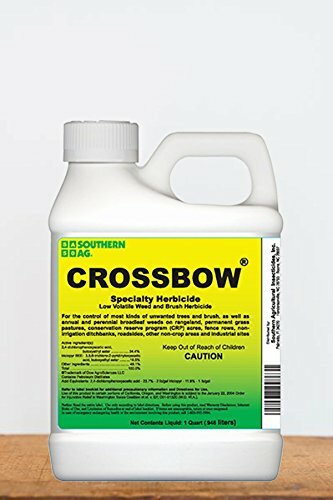 Southern AG specializes in producing high-quality concentrated solutions which are marketed toward gardeners and beginners alike, and their Crossbow concentrate is no different. This spray is designed to eat away at even the toughest types of weeds on lawn turfs, taking them out at the root so that they won't come back. This is a low-volatile concentrate, which means that it gets the job done without a high-intensity blast of your turf below. Because the spray comes in a concentrated form, you'll need to mix it yourself. In addition, you will need to use an external sprayer to spray the solution across the lawn. We recommend the Chapin 2-gallon multi-purpose sprayer in order to get the job done. This product is perfect for those with sprawling turfs who need a great, multi-purpose weed-killer that will get the job done without costing them a fortune. 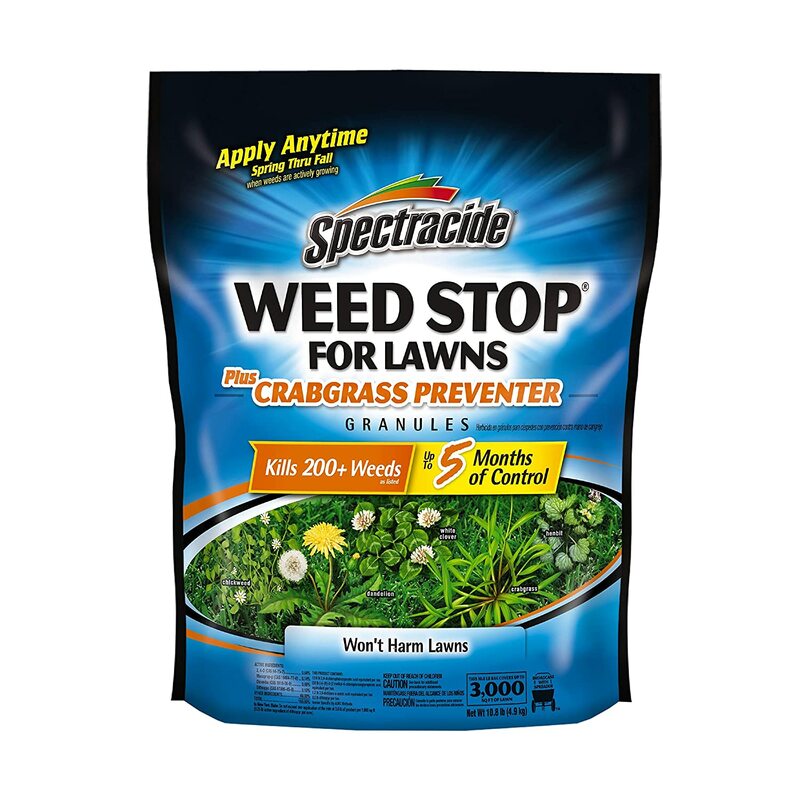 Spectracide's Weed Stop for Lawns has cracked the code on how to take out pesky weeds on the lawn and prevent them from growing right back. With their Weed Stop For Lawns, you can kill off the weeds growing along your turf without harming the lawn below. The granules work to kill over 200 different types of weeds and actually prevent crabgrass from growing, all the while keeping your lawn fresh and healthy. Once the weeds have died, the granules work below the soil for five continuous months to make sure they don't return. 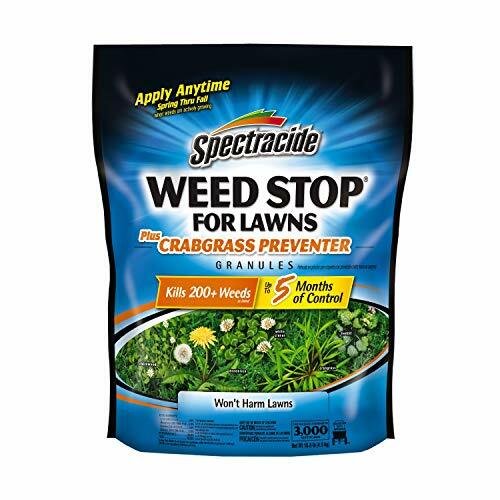 For best results, apply Spectracide Weed Stop for Lawns in the summer months with a garden spreader and watch the weeds wilt! 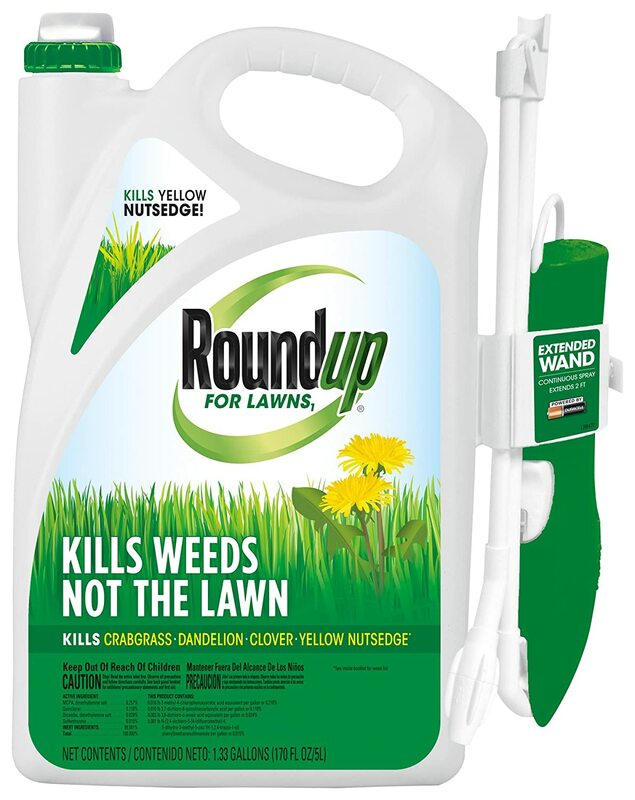 The Roundup brand has become synonymous with weed-killing due to their laundry list of herbicidal product on offer. 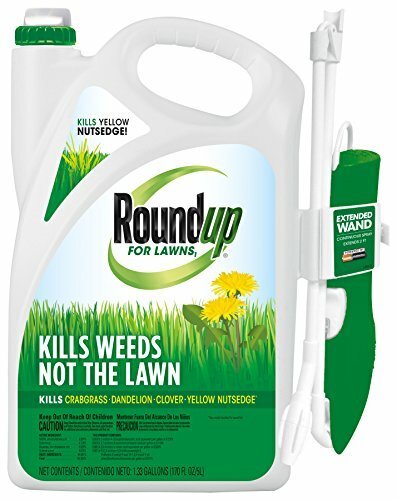 Roundup For Lawns is no exception: this ready-to-use spray targets and kills 253 types of weeds without harming the turf below, leaving your lawn looking manicured and fresh. Roundup For Lawns begins immediately to kill weeds to the root, ensuring that they won't return in a few weeks' time. This spray is ready to go on arrival, no mixing required! Because it's pre-mixed and measured, you don't have to worry with the hassle of mixing mishaps or snafus. Simply spot-spray your weeds with the wand (which is included in the container), and you'll be well on your way to a weed-free lawn. We recommend Roundup for Lawns to those who want a name-brand product and don't mind paying slightly extra for the peace of mind in its established quality. The last thing anyone wants to see in their landscape is a crop of ugly weeds. If your lawn has a weed problem, you need a solution—and the sooner the better.